Here you will find loads of birthday party ideas and tips to make it easy for you to organise a really fabulous children’s birthday party. General Birthday Party Tips you love having children running around wild, out of control, and difficult to handle, the best way to achieve this is to have disc or dance music blaring, the louder the better. If on the other hand you want your guests to behave in a reasonable way and you want to have a chance of controlling them, and having an enjoyable party, then the first rule is to have reasonably calming music playing. Actually it is worth considering whether you need music at all except when it is part of a game like musical statues or pass the parcel. But if you do go for music, keep it calm and keep the children calm too. If you are having a young children’s party, the parents will often stay, and sometimes they can be a real pain: hanging around, socialising, drinking tea, getting in the way and generally not contributing anything positive to an event that is supposed to be for children. Sorry if this sounds a bit jaded, but I have been to a lot of parties that have been ruined by parents! Make it clear that they are welcome to stay, but they will be expected to help with games, tidying up and looking after children. And do remember that children are sometimes better away from their parents! As the children are dropped off, get the parent to write their mobile number on a sheet of paper next to the child’s name. and if you don’t know all the children, its a good idea to write the childs name on a sticker and stick it on them. Lunchtime Parties are much better for everyone – you can start with games, then an entertainer, then food which the children will eat because they are hungry at that time of day. The other advantage is that you avoid the mid afternoon droop that children (and a lot of adults) can suffer from. This is particularly true of the birthday child who may have woken early and been excited all day, and can be quite worn out by mid afternoon. Oh and if your normally angelic child isn’t quite on their best behaviour on the day, don’t worry it’s quite normal. Children aren’t always used to being the centre of attention and it can be overwhelming. 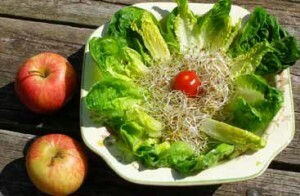 Keep it simple and don’t over cater – I go to a lot of parties and I see an awful lot of food thrown away. If its a lunch time party children will eat more than they will mid afternoon. Don’t overdo the sugar, and try to keep it reasonably healthy. Bowls of cherry tomatoes, grapes, cheese and pineapple always go down well, and unlike sandwiches, the left overs don’t have to be thrown away. The most popular food among children is sausages, preferably dipped in ketchup, and served on a bun. Vegetarian versions are available but most children with vegetarian parents prefer the real ones if their parents aren’t looking! You can just put a whole tray full in the oven, or if you want to make life really easy, tinned sausages that you just boil up go down very well. The tradition of blowing germs all over the birthday cake probably came from the days before vaccinations, when children were sent to parties in order to catch diseases like rubella and chilckenpox in order to get them over with. If you prefer something a bit more hygienic, serve individual cup cakes and let each child blow out their own candle. There are plenty of energetic noisy games, but do mix in a few quiet ones too. Musical statues and sleeping tigers are good and you can spin them out a bit by playing the music for a bit longer between the stops. Traditional games are good because everyone knows how to play them, but it can be fun to try out some new ones too. there’s a great book of pirate party games by Professor Paradox – click the image for details. 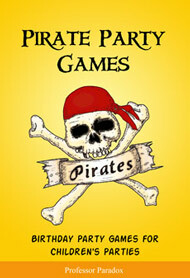 Although they are pirate games, they can be adapted to fit any theme, and its a good read too.